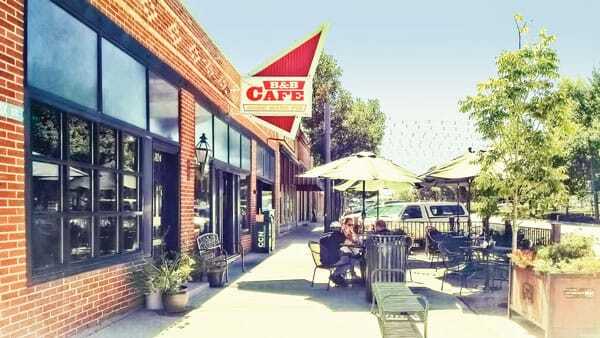 Castle Rock is rich in history, and one of its most notorious landmarks is the B&B Cafe. Nearly seven decades ago, the establishment’s name was registered by Laura Barker and her son, Howard Barker – thus, B&B. Although there have been several different owners throughout the years, the name remains the same, solidifying its place in Castle Rock’s history. The interesting past of the B&B Cafe dates back to February, 1946. It was then that a teen fugitive wanted for shooting two Denver police officers got hungry while hiding out in Castle Rock. Choosing to stop at the B&B Cafe for lunch, it wasn’t long before he was recognized by customers. A patron set out to alert the town marshal, who lived a block-and-a-half away. Unarmed, they returned. An altercation ensued, resulting in Marshal Raymond Lewis’ death. Several brave individuals who were present that fateful day acted quickly, wrestling the shooter down and taking him into custody. 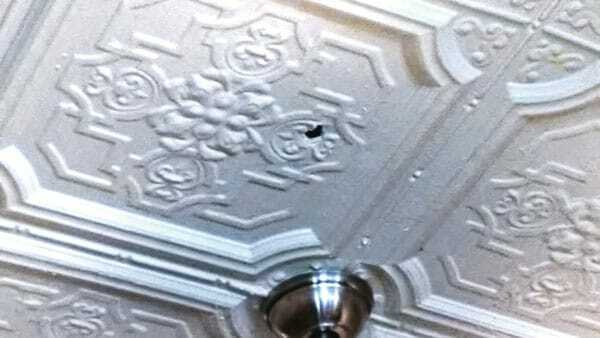 Several gunshots were fired, and a bullet hole remains in the ceiling panel to this very day. Another unique tidbit of history customers will notice upon entering the cafe is the exquisite marble bar that one might not expect to find in a quaint littleCastle Rock cafe. 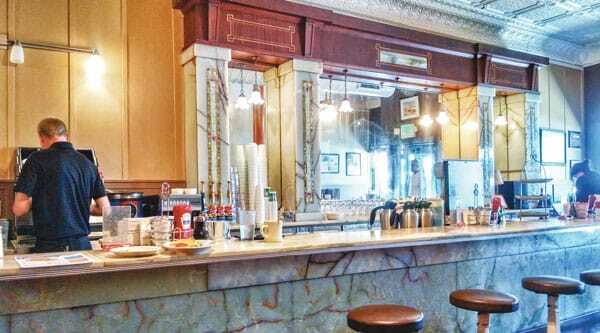 Acquired from Leadville, Colorado, by way of Italy, it is hard to imagine the beast it must have been to transport before the marble made its permanent home at the cafe. Fast forward to current day, under the charming overhang of lights across Wilcox Street – that’s where the B&B Cafe still thrives. 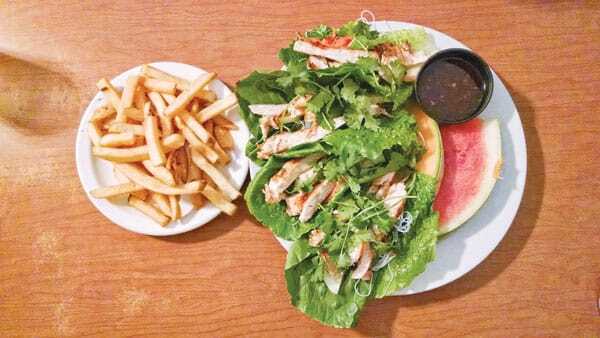 Having been an integral piece of Castle Rock for many decades, it has earned its restaurant “staple” status. Robert and Susan Schoene recently purchased and restored the cafe. “We took over operations at the B&B Cafe about two years ago,” Robert noted. Featuring a plethora of breakfast, lunch and early dinner choices, the menu has options that can please most hungry forks. It features several eggs how you like them creations, sandwiches and burgers, along with some fun burritos and wraps. The backside of the menu offers delectable dishes for those going the gluten-free route too. Similarly, the coffee and drink list lends a bit of simplicity, giving patrons the standard choices of juice, coffee or soda beverages – in addition to some options with flair. On the day of my visit, it was hard to decide between breakfast and lunch because it was inching close to noon. While enjoying the latte our fantastic server Zach brought to the table, I made the decision to order the Denver omelet and my lunch partner opted for the Asian (lettuce) wrap. It was no time before our food was brought to the table by none other than the co-owner Robert Schoene. Very attentively, and not knowing we were reviewing the restaurant, he gave us a grand “Good morning,” announcing our food and asking if we desired anything else. What a nice touch! Like my foamy latte, the first bite into my omelet was onpoint. 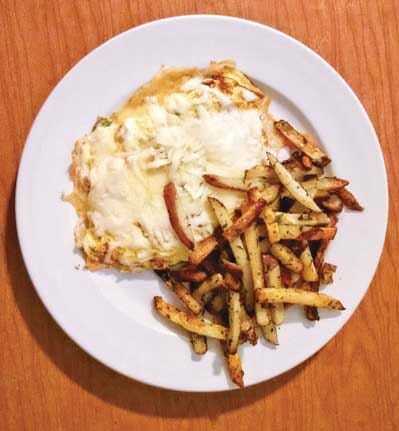 The melted Swiss cheese over the egg-wrapped onions, green peppers and ham tasted as expected and the generous helping of breakfast fries were especially delicious. They were lightly pan fried, like hash browns (but better) and seasoned with a combination of herbs. When I called Mr. Schoene over to inquire about the seasoning, his reply was, “It’s a family secret, so I can’t say, because you know what that would mean for you.” Of course we all laughed and then he told me the ingredients used; however, I was sworn to secrecy. It’s a “you just have to come in and try them for yourself” situation. My lunch partner obliged me and saved an Asian wrap for me to enjoy. As we ate them, the only words we could utter were “wow!” We crunched through the lettuce into the grilled chicken, carrot, noodle and cilantro bunch and finished with a sweet and salt, Asian sauce mixture. The entire lunch experience – the great service, the taste of the food, and having one of the owners actually take the time to talk with us at our table – instills confidence that theB&B Cafe will continue its reign in Castle Rock. The place invites all ages and the prices are what one would expect to spend in a casual atmosphere, $10 to $15 a person. Likewise, upon leaving, we appreciated that the location of the B&B Cafe encouraged us to stroll and experience the charm of the Town of Castle Rock. 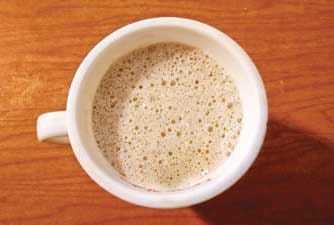 The B&B Cafe is located at 324 Wilcox Street in downtown Castle Rock and is open Monday through Friday from 6 a.m. to 2 p.m., and Saturday & Sunday from 7 a.m. to 2 p.m.
For more information, call 720-733-7827 or visit www.thebbcafe.com.